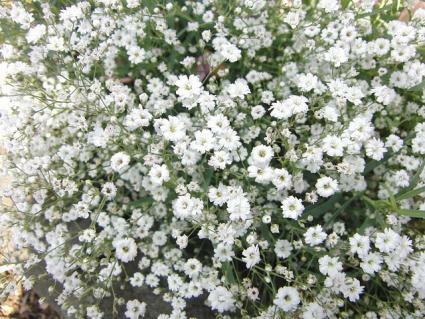 Most people know baby's breath (Gyspophila spp.) as a plant used by florists in bridal bouquets, but it's also possible to enjoy those light airy sprays of white flowers in you garden. There are a few different types of baby's breath that can be grown, each with specific uses in the landscape. Depending on the variety, baby's breath are useful as bedding plants, groundcovers, rock garden specimens or in wildflower plantings. All types grow best in full sun, but will tolerate partial shade. 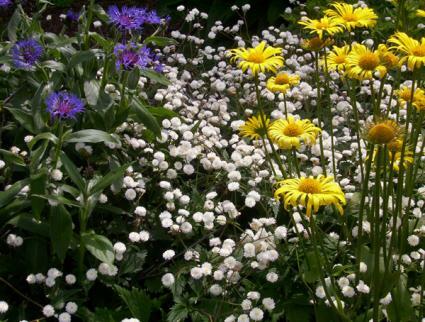 They like poor, gravelly and dryish soil, but will grow just fine in average garden soil, as long as it is not acidic. In fact, alkaline soil is one of the keys to growing baby's breath - amend with lime or wood ashes if you live in an area with acidic soil. This is the most common variety used by florists (Gysophila paniculata), but it must be noted that it is invasive in some regions, especially in the western United States. However, if you pick the flowers before they set seed, you will prevent it from escaping the garden. It is primarily the basic species that is invasive; the cultivars listed below are usually safe to grow. Perennial baby's breath grows three feet tall and wide and is at its best when massed informally as a filler among other taller flowers - much as florists use it in bouquets. Viette's Dwarf is a smaller cultivar reaching about 18 inches tall and wide and bears sprays of light pink flowers. Bristol Fairy forms a neat, tidy mound of foliage and features double white blossoms. Perfekta closely resembles Bristol Fairy, except the flowers are twice as large. 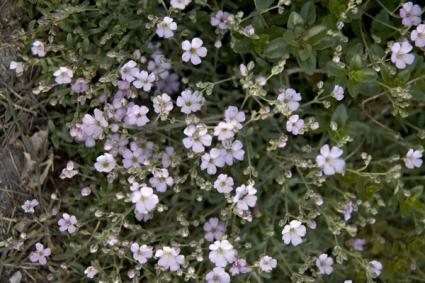 Annual baby's breath (Gysophila muralis) closely resembles the perennial variety except that grows to only about one foot tall. Like the perennial varieties, it is also capable of spreading itself by seed - though this is more common in the eastern states - and on the whole it is not considered nearly as invasive as the perennial variety. Seed can be sown directly in the bed where it is to grow in early spring, even of the soil is still cold. 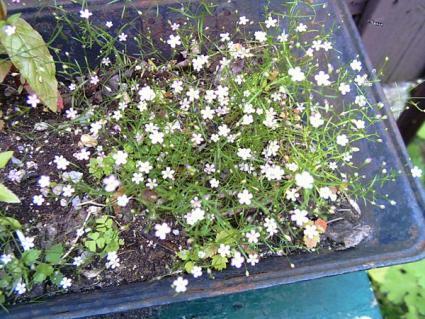 Annual baby's breath is useful as a bedding plant or naturalized in wildflower plantings. This form (Gysopila repens) is used as a groundcover, especially in rock gardens where it is picture perfect creeping over small craggy stones. Growing four to six inches tall and spreading about 24 inches wide, it is the least aggressive of the different types of baby's breath. Otherwise, it is quite similar with the familiar sprays of white flowers held just above the green foliage. Baby's breath almost seems to thrive on neglect - over watering or fertilizing are two things that can lead to its demise, or at least reduce its flowering. If a baby's breath plant is looking poorly, it is likely that it is either growing in acidic soil or in a poorly drained or excessively shady location. It's also important to avoid transplanting baby's breath, as the stems and roots are very fragile and can easily be damaged. Trimming off the dead flowers is a great way to keep more of them coming. Otherwise, there is little to do in the way of maintenance and pests and disease are virtually non-existent as long as the basic requirements are met. Blooming from spring through frost, the tiny white flowers of baby's breath seem to float above the foliage, matching the delicate calmness of a sleeping infant. If you want to cut some for a bouquet, do it before the flower buds open - they will last longer in the vase that way.